PES, Inc. is a privately held, New York-based company, which offers innovative engineering, manufacturing, and management solutions to product developers, manufacturers, and service organizations worldwide. 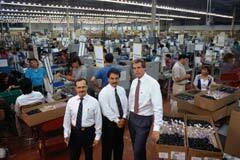 Since 1997, PES staff have managed or contributed to technical projects and US Patents both in the US and abroad. As a relatively small firm, we have always been able to flex effectively to meet the changing needs of our dynamic customer base. Our strategic partnerships have greatly enhanced our knowledge and resource pools, and will continue to assist us in supporting a wide variety of technical requirements. PES technical project managers have forty-five years combined experience leading new product design programs, worldwide. From fabricating complex microchip manufacturing equipment within the semiconductor industry to designing custom manufacturing systems used in the pharmaceutical industry, we meet the challenge and consistently exceed customer expectations. Our "family" of seasoned professionals works closely with customers to understand their needs through creative brainstorming and in-depth evaluations during each phase of every project. Our technically detailed, yet personal approach ensures effective and long lasting partnerships built upon a strong foundation of top performance and trust. We believe a strong sense of ownership, detailed communication skills, effective management strategies, and innovative process technologies are amongst some of our greatest assets. We see our primary focus as insuring the success of our customers. This focus results in the driving force behind the success of every product and service we commit to delivering. PES was founded on these basic principles and remains committed to them each and every day.